Sweet, tangy, savory, a tingle of Worcestershire and a hint of paprika. 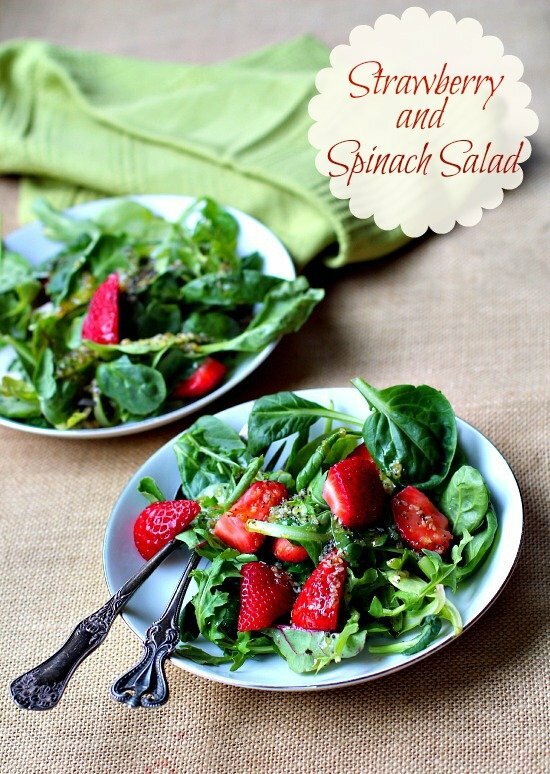 We loved this one and as far as I’m concerned, this is the only Strawberry Spinach Salad Recipe you’ll ever need. If you’re like me you’ve saved umpteen salad recipes for different greens and dressing combos in your database. 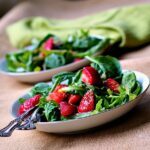 I noticed that over the years that I had entered several versions of strawberry salads and spinach salad recipes without very good notes on which one I preferred. I’m sure they’re all very good, but I can never remember which one is the dead-ringer best. This past weekend, with a flat of strawberries in my hand and a hankering for a strawberry salad, I decided to ditch the database and Google “Best Strawberry Salad”. Sure enough the top result included spinach and a predictable sweet, sour combination. With all ingredients on hand I prepared it for our dinner and I must say, move over puppies and babies, this salad “stole the show” and was star of the meal. This best part about this recipe, is not only did I delete the five strawberry salad recipes that loitered my database, but it caused me to toss away some of the other combos that just didn’t measure up to greatness. No riff raff salad clutter remains, only the outstanding and this being number one. 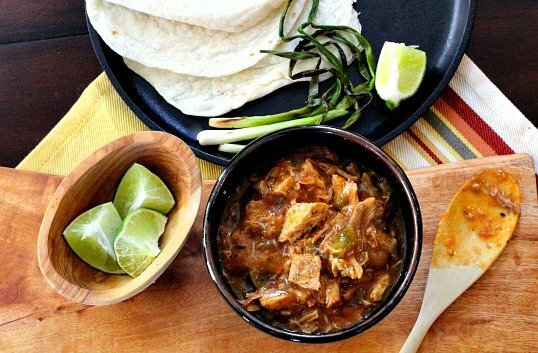 I found this over at Allrecipes and every single reviewer sang it’s praises. Sweet, tangy, savory, a tingle of Worcestershire and a hint of paprika. We loved this one and as far as I’m concerned, this is the only Strawberry Salad you’ll ever need. 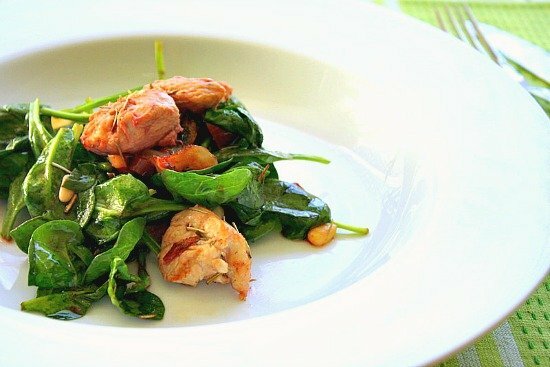 Love those spinach salads? You won’t want to miss this Crunchy Spinach Salad with Bacon. It’s a good one. The best and only Strawberry Salad recipe you'll ever need. Place garlic in a salad bowl. Rub garlic into the bottom and sides of the bowl. Place the spinach into the garlic rubbed bowl. Pour the dressing over salad, and toss until well coated. Sprinkle on the strawberries and almonds.. Refrigerate 10 to 15 minutes before serving. 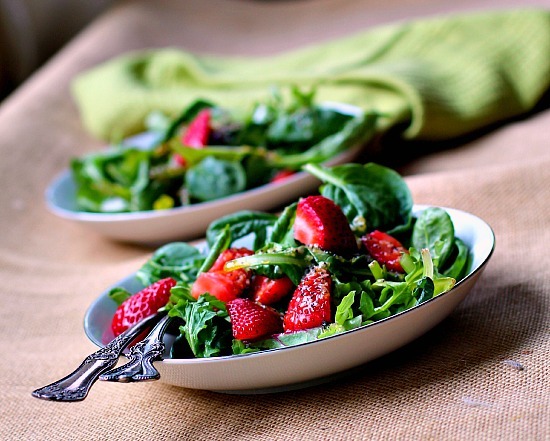 Strawberry Spinach Salad … It’s what’s for a Side Dish. Well, this sounds strawberrylicious to me. I just might throw in some feta or goat cheese to make it my whole meal! Thanks Lea Ann! Love the strawberrylicious! And the addition of goat cheese. That’s exactly what I thought about this salad, a good base for lots of additions. How pretty and beautifully presented. I love strawberries no matter how they are presented. This reminds me of a salad that I love to make it the summer that is made with a honey mustard dressing and lots of strawberries, red onion, bacon and Parmesan. I think I’m going to have to go buy some strawberries. Now I’m hungry! This looks so good. Next time I make this it will include bacon. ok, now I’m officially hungry. Oh I have a Costco sized portion of strawberries in the kitchen now. This salad would be a great way to start to use them. 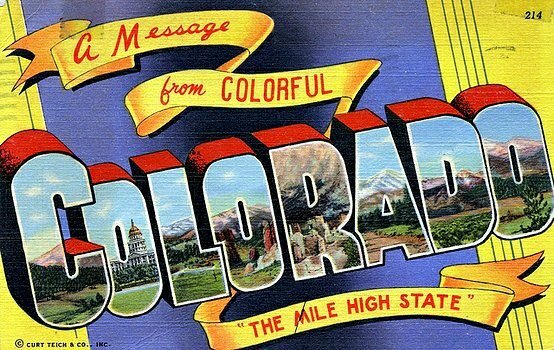 Thanks, Lea Ann! That same flat of strawberries from Costco is exactly what inspired me to Google for this recipe. Enjoy! I have all the ingredients for this also I will try it tonight -Strawberry Fields forever!! Let me know what you think Jaime. We loved the recipe. Definitely pinning this. I think I need to start a “absolute best” board. Holy cow, this DOES sound delicious and your photographs only convince me further. It’s just beginning strawberry season up here in the north of Australia and I’ll make this today! Good looking salad Lee Ann, love the addition of the Worcestershire sauce. Wow, what an endorsement for ‘the best’ strawberry salad. I’ve got to make this soon! Strawberry salads are one of my favorites! Thanks for sharing and your photography is AMAZING, Lea Ann! We love strawberry salad here and I don’t know if I could ever stray from our favorite although this one sounds similar in many respects. Those are some beautiful looking berries too! I like the idea of using Worcestershire sauce instead of the usual balsamic vinegar! It sounds fabulous! This really does look good! Up until now, my favorite strawberry salad recipe included roast strawberries. But this one looks like a contender! Really good — thanks. That looks so good! We must be working on the same wave length because I’ve been making berry salads this week! This sounds like a great way to use up those summer strawberries. Light and fresh! I like it except sometimes when I eat fresh spinach raw, I get that weird crystalline feeling on the surface of my teeth, ever get that? You know how Wendy’s is selling their Strawberry Fields salad for “a limited time only” – someone put a picture of that up online and said “The Beatles lied”. I split a gut laughing at that. Haha – last year we decided to landscape the hill with strawberries since they’re prolific growers and spread so easily. This salad will come in handy. The crowds raved over this salad. It seems to be perfect in every way.